The Wireless Vehicle-Link 2 (WVL2) uses your laptop's wireless Wi-Fi internet connection to communicate with the heavy truck through the 6 & 9 pin connector. The WVL2 provides a state-of-the-art diagnostic interface for heavy-duty truck applications with a range for up to 300 ft. using 802.11. This connector also has a 15 foot wire for traditional wired connections to the truck. Applications are NOT included. 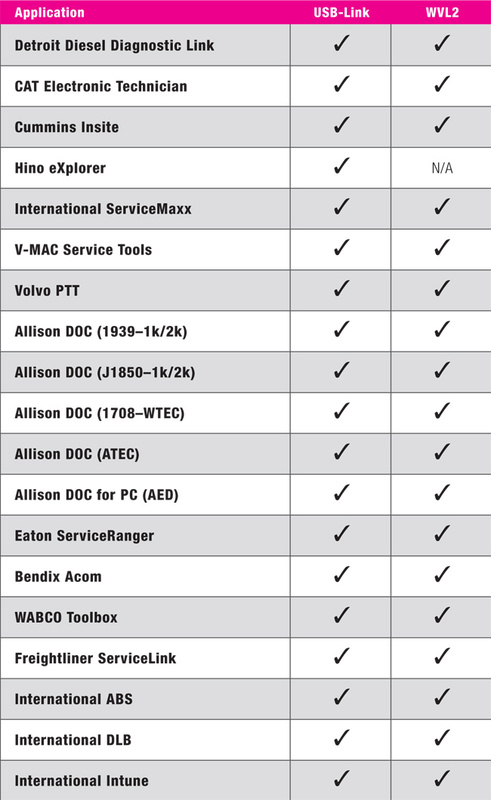 Use the table to check whether the software application you are using is compatible with the PC to vehicle interface tools in the chart. *Not all applications will support 64 bit versions of Windows, and not all applications support all versions of Windows.